Why did that happen? A lot of the reason for the slow decline had to do with inflation. The US Inflation rate dropped from almost 4.00 percent in 2000 to a minus 2.00 percent in 2009. In the absence of inflation, the Fed has little reason to start increasing interest rates. Key areas of inflationary growth over the last decade have not surfaced. For example, wage pressure (year-on-year growth) in average earnings in America was just 2.5 percent. Sluggish economic growth was another reason. Driven by the overhang of the debt crisis, the economy was in a state of secular stagnation - until just recently. With record low unemployment now below 4%, wage demand was starting to rise. Mild inflationary pressures have also begun to build. Since 2015, the US Inflation Rate has gone from minus 0.1 percent to 2.9 percent in just over two years. Addition signs of economic recovery are showing up in GDP (1.4% in 2016 to 2.9% in 2018) and business and consumer confidence that are both now at five year highs. In response to an improving economic outlook, bond yields are (finally) starting to rise. Just within the last few months, the benchmark 10-Year US Treasury Yields have broken out of multi-decade downward trend and appear set to advance to 3.50 percent over the next year. 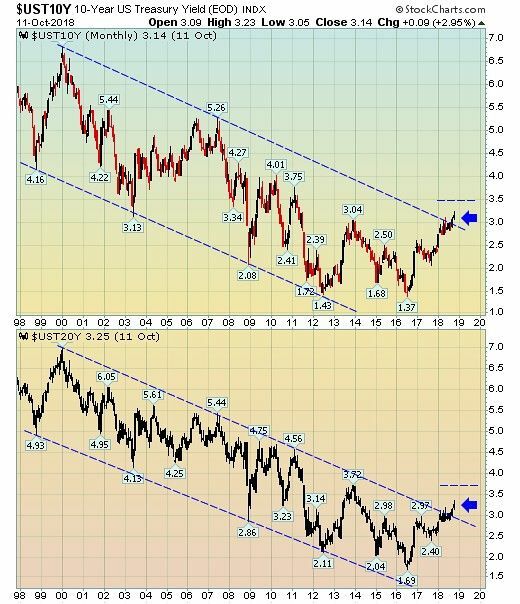 The longer duration 20-Year Treasuries have also broken out of a well contained descending trend and are now poised to test the 3.75 percent level by mid-2019. 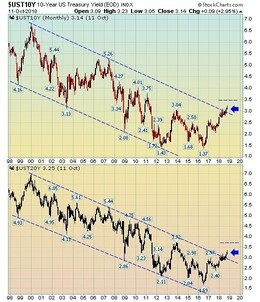 Bottom line: The recent breakout of yields from a long downward trend is a positive development. First, many good factors are driving this advance. Higher yields reflect increasing comfort with the growth and inflation outlook. Second, despite moving up this year, rates remain at historically low levels. They are well below what would normally be associated with the current growth and inflation. And finally, it is unlikely that this move is the start of the beginning of a larger more aggressive move in rates. The economy (and market) is still in a deflationary stance.